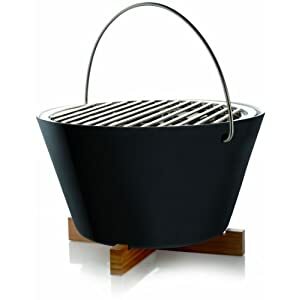 The Eva Solo Porcelain Table Grill is stylish and compact & will look stunning on any table, on the beach or in the park. Perfect far BBQ’s and gatherings. The main part of the Grill is made from porcelain which is fireproof and has a handle attached which makes it easy to carry around. The internal insert which holds the coals and the grill are made from steel and are both easily cleaned in the dishwasher. The grill is 30cm in diameter with a 25cm cooking area. The table grill sits it stands securely on its table protector helps to stop you burning the surface your grill is placed on. All in all the Eva Solo Porcelain Table Grill is an attractive and useful solution. It comes in either black or white.